"Total In-Line Quality Control - ZUMBACH has the solution for all quality parameters which have to be monitored and/or controlled on line. USYS multi-tasking systems process measurement data from a variety of sensors and communicate with the user as well as other host computers. USYS processors also control extrusion lines or other manufacturing lines with intelligent self-adapting controllers, like for instance, SIGMA-EXPERT® and CpK-Pilot®. All quality parameters can be displayed." AutoSoft is not affiliated with Zumbach. The Zumbach USYS system does an excellent job in process control of continuous operations. Where the USYS leaves off is where the AutoSoft suite of software begins. The basic USYS system does not have the ability to store and maintain process data long term. Only data from the reel currently being manufactured and the most recently manufactured reel is maintained inside the USYS computer. If some other software package does not query the USYS computer immediately after a reel has been completed, the process data for that reel is lost. Additionally, a copy of UltraVNC (www.uvnc.com) will be installed. UltraVNC is a first class remote control software package which is totally free of any licensing fees. This will allow system administrators and AutoSoft Systems personnel to configure and service the computer remotely. 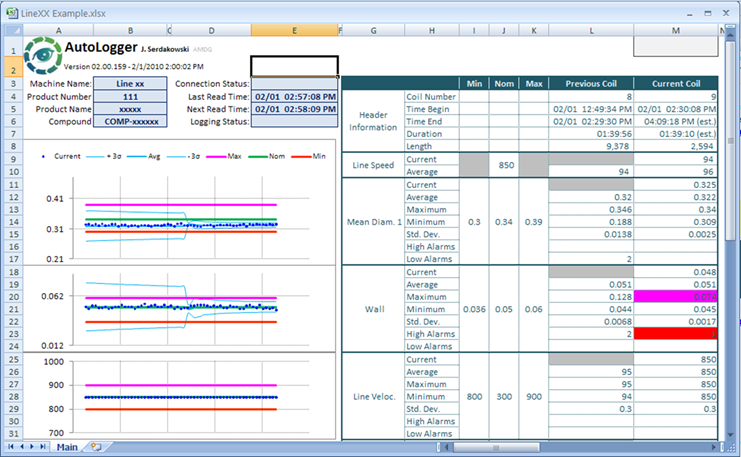 AutoLogger runs inside of Excel and continuously queries the USYS computer for the status of any subset of the myriad of process parameters made available by the USYS. The retrieved data can either be stored locally or stored on an existing file server located on the LAN. Additionally, AutoLogger continuously updates the AutoStatus software. AutoStatus Software provides authorized users with up to the minute status reports on the state of all production lines equipped with USYS computers. A color coded summary screen renders a snapshot of each production line. The user can then click on a production line icon to retrieve detailed information on the chosen line. Like AutoLogger, AutoStatus runs in Microsoft Excel. 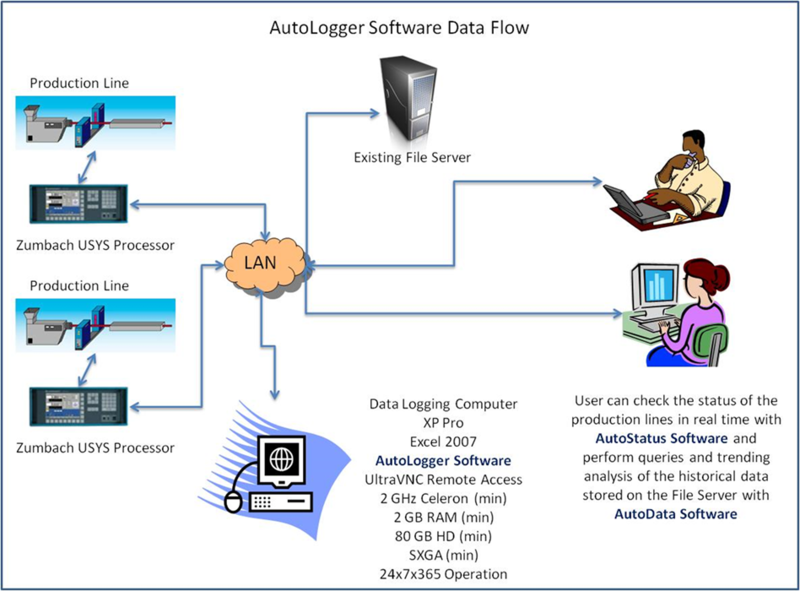 AutoData Software is a query, historical analysis and trending tool for the data retrieved and stored by AutoLogger. Also written in Excel, it is intuitive and easy to use. Since the data is exported to Excel files, the user can easily perform whatever detailed analysis is required using the familiar suite of Excel functions. As with all AutoSoft software, the source code is included.